Pretzel bits, oyster crackers, and rice crackers are coated with delicious chili powder and lime flavors to make this game day worthy snack mix for any crowd. Chili Lime Pretzel Mix has that Tex-Mex flavor that kicks all over football snacks in the you know what! This month I was paired up with Turnips 2 Tangerines. I think Lynn was one of the first blogs I ever followed on reader and now Bloglovin. I also think she was one of the first people to comment on my blog. Granted, it was an error in a recipe I posted, but still, it was a comment from an establish FOOD BLOGGER! How cool was that? Some might actually say that of me, but honestly, I’m just a person trudging through life TRYING to be a good blogger. I just love food, love making it, and love sharing what I’ve made if it tastes good. Like tonight’s dinner. It was pretty good. Granted, we’re moving this weekend, so I may or may not be able to photograph this dish for a post. We’ll just see how it goes. I was not as organized as I had hoped to schedule posts for this weekend. We’ll see what happens. In any event, here’s how this recipe and its thought process went down. Since I’ve started the PEP plan, I try to monitor my fat intake and my carb intake. This leaves little room for snacks. Potato chips? Baked. There’s little choice and very few flavors in this category. Pretzels? Not any better. I have honestly been jonesing for some tasty nibbles on the weekend. The hubs has his potato chips – jalapeno cheddar – and I have…pretzels. Maybe if I’m lucky I can find a honey mustard or a sesame, but that’s about it. I crave flavored snacks. Seriously. So, while I was perusing through Lynn’s blog, I found some snack mix recipes. Oh. Yes, please? I have honestly had some flavored pretzels on my radar to cook up on the oven. Seriously. I’m so tired of eating bland pretzels; even those poppers or whatever they’re called. I crave flavor!! I crave lime flavored tortilla chips. Flavor that is full of fat and salt and unhealthy stuff like that. I have a few bottles of sodium laden popcorn flavoring that I planned on making flavored pretzels with, but just never did. So, finding this delicious Chili-Lime Chex Mix was kismet! It was screaming, “MAKE ME NOW!” You mean you didn’t hear it? Lynn and I have more in common than I realized. We have both been entertaining and planning parties most of our lives. I think I grew up as the hostess for most of my parents’ parties. I think it was an acceptance thing or wanting to please the ‘rents thing. Who knows? I also love everything food related; except the shopping part. Not for the food aspect, but the people aspect. I don’t like people. But that’s another post. I honestly eat, breathe, and sleep from meal to meal. I’m always thinking about the next recipe I’m going to create, how I’m going to re-purpose those left overs or use the items in the freezer, and how to recreate or re-vamp an existing recipe. And I wonder why I’m still overweight. Shocker. Lynn’s blog is chock full of delicious recipes of all kinds. She has meals, baked goods, snacks, and all types of recipes to whip up. This is one of many mix recipes she has whipped up. There’s puppy chow, muddy buddy, and tons of other snack mix recipes, not to mention TONS of desserts, main dishes, side dishes. She literally has something for everyone! But this week, I was all about the snack mix. I highly suggest you head on over there and read all about it. 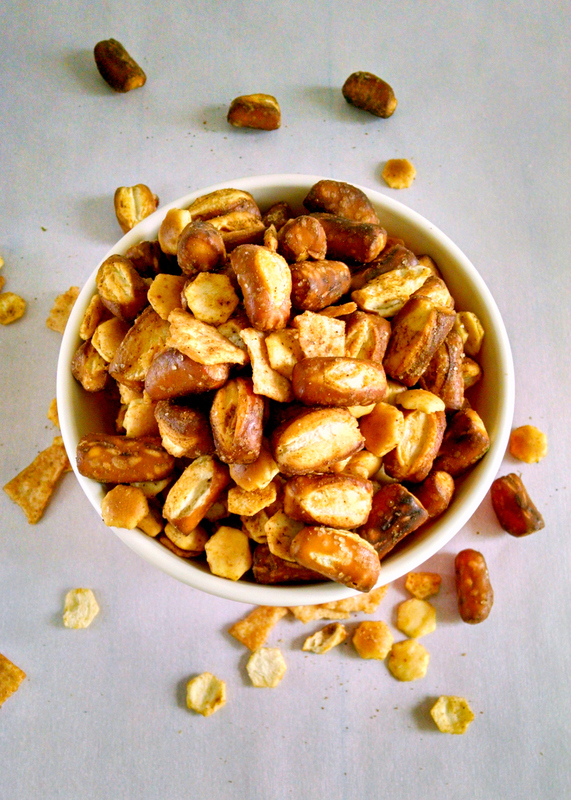 While you’re at it, check out the recipe for Chili-Lime Chex Mix. I altered the ingredients just slightly for my snacking preferences, but the rest of the ingredients remain the same. I used butter spray in place of the butter and added a pinch of cumin to the mix. Instead of Chex cereal, I used sourdough nuggets, instead of pretzel twists, I used oyster crackers, and instead of corn chips, I used cheddar rice crackers. Yes, I know. It’s an interesting assortment of snacking implements, but honestly, they taste fabulous! They taste especially fabulous with the chili lime flavors that are in the recipe. Lime just screams Tex-Mex in my book. Doesn’t it? The juice and the zest meld perfectly with the chili powder and the Cajun spices. The pinch of cumin I added rounds out the Tex-Mex flavor for my taste buds. For me, it’s not Tex-Mex without some cumin. This recipe is delicious! The lime flavor really comes through with the kicked up spices. Baking all the ingredients makes them ever more crunchy and tasty. That’s what I need; crunch and taste! 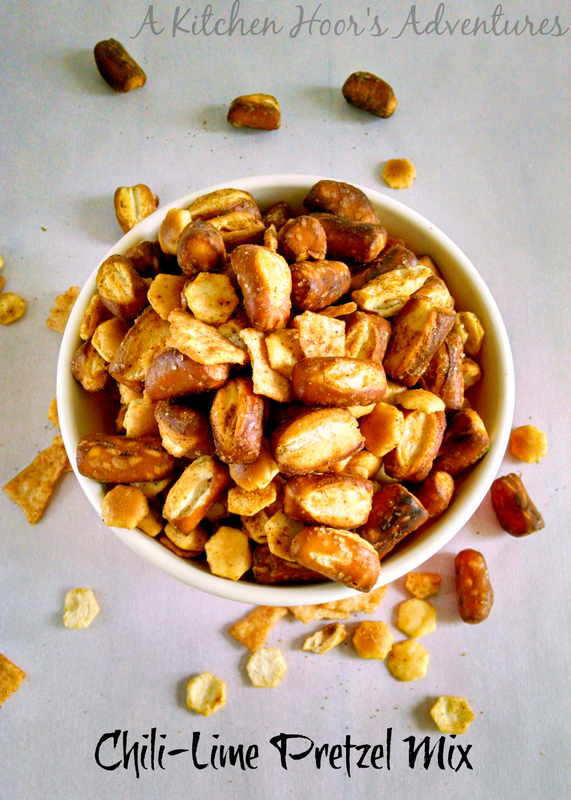 You won’t regret making this Chili-Lime Chex Mix from Lynn’s blog. Please make sure you follow Lynn on Facebook, Twitter, Google +, Pinterest, and Instagram to make sure you catch all the delicious goodness that she whips of all the time on her blog. Also, please make sure to check out the SRC! It’s so much fun to find new blogs and friends to follow. 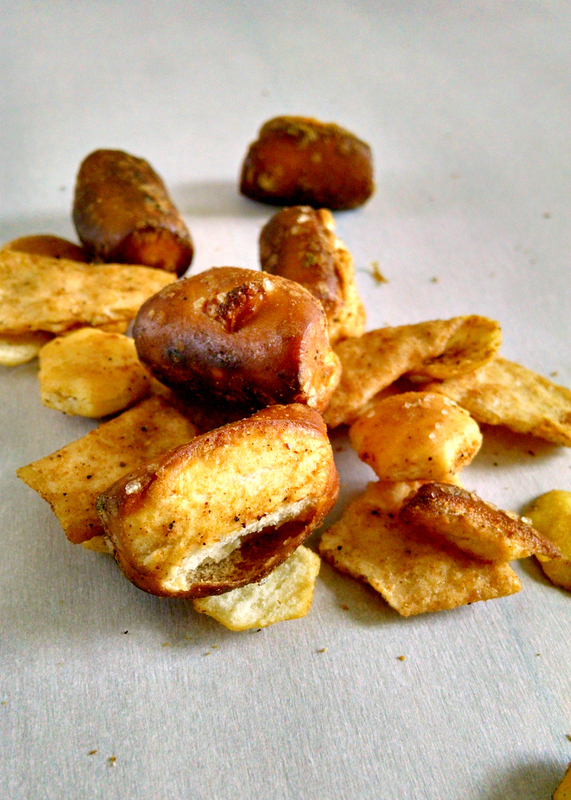 Lime zest and chili powder make for this delicious Chili-Lime Pretzel Mix inspired by Turnips 2 Tangerines Chili-Lime Chex Mix. Combine the pretzels and crackers in a large bowl. In a small bowl combine the remaining ingredients (butter through Cajun seasoning). Pour the butter mixture over the pretzel mixture and stir well to coat. Bake at 250 for 1 hour stirring every 15 minutes. Once baked, remove from heat and allow to cool on parchment paper. Massalé Roasted Chicken by Oh! You Cook! Oh super great pretzel mix! Saying hello from Foodie Friday! I could go for some of this right now! It looks great, Christie! What a fun pick. Pinning and sharing!! yum yum yum! I love pretzels and I never thought to flavor them! I can't wait to try this! SRC sounds like a lot of fun! 🙂 I love the combination of Chilli lime too! Yum! Sounds worth a try! Sourdough pretzels spiced up sounds wonderful! Great SRC choice! Oo I love making seasoned hard pretzels! I'll have to add this to the list of variations to try. I'm having a bit of a clean living month, so right now I have a moratorium on snacks like this, but trust me – this is bookmarked for a couple of weeks time when the gloves are off!! This looks so good. It can be hard to find healthy snacks when potato chips just sound so much better than pretzels. I make chili lime roasted garbanzo beans a lot (tastes like and has the texture of corn nuts). Love this! The combo of chili and limes sounds SOOO yummy! And this is perfect for a super bowl snack!! Yum yum yum! Love me some flavorful pretzels 🙂 Happy reveal day! Chili-lime goes well on anything in my mind…. and pretzel mix… Well, that is one of my weaknesses… so you can imagine how much I enjoyed reading your post.. This sounds AWESOME! And perfect for game day snacking. I so want to plunge my hand into that yummy, crunchy snack mix right now! Yumm!! Time to get the game on….grab a beer and your mix and we are ready to go! !